In the several years that I have been playing at becoming a t-shirt artist, it has been my good fortune to meet a lot of interesting people. Artists come in all shapes and sizes, and a plethora of personalities. They range from the snobby purists that are so sure they are much more talented than you will ever be (but don't sell near as much as you do), to the peeps that don't take anything seriously, and are just there to have a good time with it all (definitely a much more fun crowd). Then, there are a very special few people like Karin Taylor. I am not sure that I have ever met anyone that manages to have such a positive effect on people as this woman. At first, it can be a bit unsettling when you meet her, because you are quite sure that nobody could possibly be this nice. But, after just a few seconds you realize that you surely must have been mistaken, and that the two of you have obviously been the best of friends your entire lives. Her smile just kind of rubs off on you in a sort of Celestine like moment way. Karin's book Beyond the Stick Figure is exactly what I would expect from her. Just as she does with everyone she meets, she takes you by the hand, gives you one of her impish Aussie smiles, and takes you on a journey that turns out to be exactly what you needed. This work isn't a coffee table photography book, a self help inspirational manual, or an art tutorial. It's all of those, and a wee bit more. 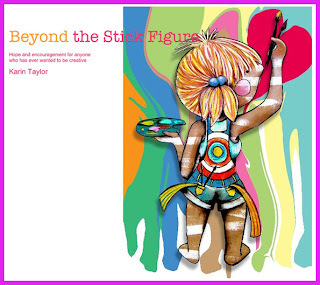 As Miss Taylor tells you the story of her art, she also offers some rather profound insights on how one can deal with the mysteries of life, the universe, and everything, or at least, how she does it. And, seeing how well it has worked for her so far, I for one am inclined to take her word for it. What did I come away from Beyond the Stick Figure with? 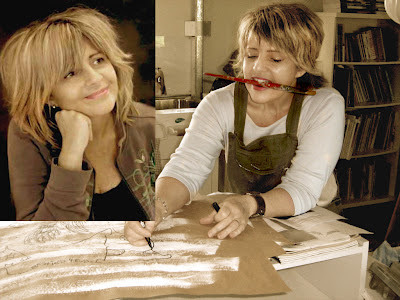 Well, I think the most important thing, and certainly the most comforting thing to me that I learned from her book is that there is absolutely nothing wrong with drawing stick figures. How can I be so sure of that? Because Karin Taylor took me by the hand, smiled, and told me so.